Why is Facebook a Powerful Marketing Tool? Facebook started as a way for college kids to stay in touch with each other and has grown into something completely different. In fact, if a company is not featured with at least a Facebook page, they run the risk of being left in the dust and labeled as an antiquated player in the industry. The latest and greatest social media marketing tool is to use the Facebook Fan Pages. 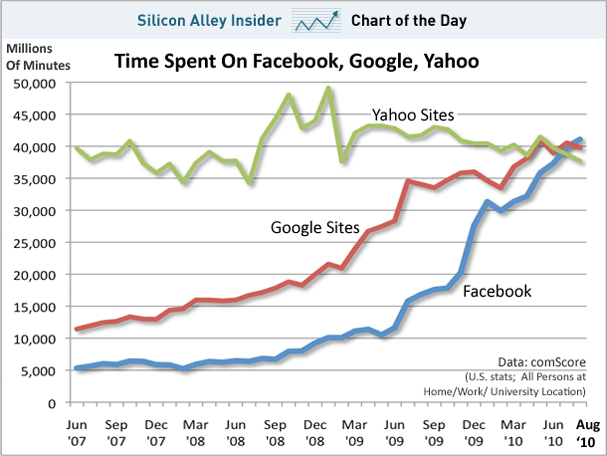 Ironically, just a few days ago it was announced by ComScore that more time is being spent on Facebook versus Google, chart below. Facebook Marketing has done a lot to promote the Facebook Fan Pages and the companies have really taken the ball. They have used it to connect to the over 500 million people currently using Facebook and with over 250 million logging on at least once a day. This means a huge opportunity for any company looking to reach a very large part of the population with expendable cash on hand. When you sign up for Facebook Fan Pages, perhaps create a custom Facebook page and use these in your Facebook advertising, you are among the biggest corporations in the world. Businesses like Coca-Cola, Jeep and more have turned their presence on Facebook into an honest advertising campaign which produces results. This is because corporate social media allows the consumer base to connect with the company on a more personal level. The additional benefit that Facebook Marketing offers any company is the ability to reach out to a more youthful, and older clientele and the ability to utilize a marketing campaign which is cheaper, yet more productive than many of the traditional marketing campaign strategies. Making sure that you are getting all of the exposure you need through Facebook Fan Pages and the like is to make sure that you are giving the consumers every reason to show up on your fan page and to sign up. This includes things like offering incentives which are only available to fan members, updates about new products before they come out and an ability to take place in product development. The more you make the consumers feel like they are a part of the process, the more they enjoy your company. This is something you will only be able to find through Facebook Marketing because no other advertising campaign offers you the ability to be quite as interactive with those you are looking to reach. Facebook is all about having fun and any company which does not embrace that idea will not be able to move forward with Facebook Advertising. This is why many companies are getting involved in constantly updating their look and their Facebook Fan Pages. The idea is to always have content which is eye catching, current and alive with youthful vigor. Another way to draw attention to your Facebook Marketing campaign is to run a contest. These are enormously popular not only to draw in new people, but to maintain the fans you already have on board. The gist of the contest will be that you will offer to give away something which is a fraction of the price for your average traditional campaign for huge amount of people learning about your company and lead generation. Not a bad way to promote your business.